On 17 April 2014, NASA announced that a team of 23 astronomers working with the Kepler mission has discovered the first Earth-sized planet in the habitable zone of another star. They published this discovery in the 16 April 2014 issue of Science. The newly discovered Earth-sized planet, Kepler-186f, is one of 5 planets orbiting the M class star Kepler-186. Astronomers designate planets orbiting stars with the name of the star and a lower case letter starting with b, so Kepler-186f is the fifth and outermost known planet orbiting Kepler-186. Astronomers classify stars into the spectral classes: O, B, A, F, G, K, and M. The M spectral class stars in the main part of their life are the coolest, least luminous, and least massive. Kepler-186 is therefore a red dwarf star that has a little less than half the Sun’s radius and mass. Kepler-186 is about 500 light years from Earth in the constellation, Cygnus. This diagram compares our solar system’s inner planets to Kepler-186’s planets. Kepler-186f has a diameter that is 1.1±0.14 times Earth’s diameter, making it an Earth-sized planet. The current data do not allow astronomers to measure the mass of Kepler-186f. If it has approximately the same composition as Earth, it would be a little less than one and a half times Earth’s mass. Kepler-186f orbits its star every 129.9 days at a distance of about 0.35 astronomical units (the same distance between Earth and our Sun). At this distance Kepler-186f receives about 0.32 times as much energy from its star as Earth receives from the Sun. Barring an enormous greenhouse effect, that insolation, or the amount of radiation coming from the sun, makes Kepler-186f cooler than Earth, but it would still be warm enough that water, if the planet has any, can exist in liquid form. 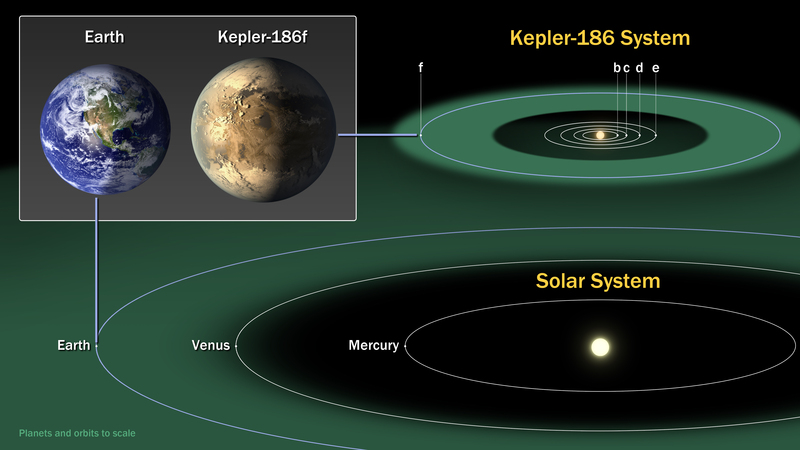 Hence Kepler-186f is near the outer boundary of the star’s habitable zone. Astronomers discovered the other four planets orbiting Kepler-186 about a year earlier. They are all less than 1.5 times Earth’s size. Their orbital periods range from 3.9 to 22.4 days. To orbit this quickly they must be closer to the star, so these planets are inside the habitable zone, and too hot for liquid water to exist on their surfaces. Astronomers discovered Kepler-186f using 3 years of data from NASA’s Kepler mission. The Kepler mission, launched in 2009, detects extrasolar planets by looking for brightness dips as orbiting planets pass in front of (transit) stars. The Kepler spacecraft contains a 0.95 meter telescope equipped to continuously measure the brightness of the approximately 100,000 stars in its field. Mission scientists chose a region in the constellations Cygnus and Lyra because this field is always available for the telescope to monitor and because it is in the star rich summer Milky Way. When a planet transits its parent star, the star’s brightness dips ever so slightly. In order for an orbiting planet to transit the star, its orbital plane must be perfectly aligned with respect to Earth. Most stars with orbiting planets will not have the orbital planes so perfectly aligned. Hence this transit technique only discovers a small percentage of the exoplanets in the telescope’s field of view. If the brightness measurements (photometry) is sufficiently accurate, however, the transit technique can detect smaller Earth-like planets that other techniques will miss. Sufficiently accurate photometry requires space based observations; Earth’s atmosphere reduces the accuracy of ground based photometry. The astronomers needed 3 years of photometry data to discover Kepler-186f. Analyzing the continuous brightness measurements, they searched for periodic brightness decreases in Kepler-186. The five series of periodic brightness decreases reveal the five planets orbiting Kepler-186. A larger transiting planet blocks more starlight. Hence, the amount the star decreases in brightness during the transit allows astronomers to calculate the size, diameter, of the planet. Photometric transit data by themselves do not allow astronomers to calculate the mass of the planet. Measuring the mass requires additional spectroscopic measurements from large ground based telescopes. Current spectroscopes are not yet accurate enough to measure the masses of the planets orbiting Kepler-186. As technology improves, mass measurements may become possible. If Kepler-186f also has a mass close to Earth’s, then it is truly an Earth-like planet. Until then astronomers can only estimate its mass based on various possible compositions. Sufficiently sensitive spectra can also reveal the planet’s composition. A very close faint background star could possibly produce false positive signals mimicking a planet. To eliminate this possibility, the astronomers imaged the region around Kepler-186 with very large ground based telescopes. They found no possible source of false positive planet detections. Kepler-186f is an Earth-sized planet in the habitable zone of its parent star. That means its temperature is in the right range for water to exist in liquid form. That does not, however, mean that Kepler-186f has water. It might. Current data are not yet sufficient to prove one way or another. Astronomers know that if the planet has water, it could be liquid, but they do not yet know if it has water. Kepler-186f is in the habitable zone, but we do not yet know if it is a habitable planet. Stay tuned for more exciting discoveries.